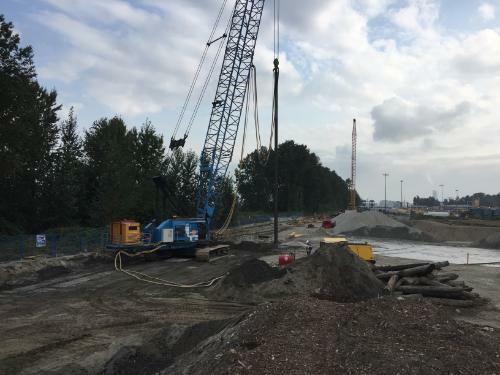 The proposed development of the dike involved the installation of stone columns and timber piles to densify the 4200m2 (12m wide section running for 354m from west to east) strip adjacent to the existing FortisBC LNG Plant in Delta, BC. 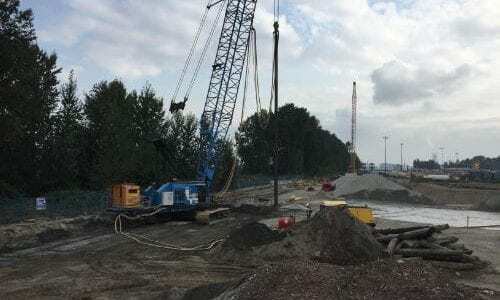 The property is bound by the Fraser River on the North, commercial lot to its west and the LNG plant to its South. Subsurface conditions generally comprised of an upper inter-bedded layers of sandy silt and clayey silt (until a 13m depth) with traces of wood and organics and a sandy layer extending to a depth of 28.5m. The sand layer is susceptible to liquefaction which risks the stability of dike. Groundwater table was encountered at about 3.0m below the ground surface. The solution consisted of a combination of vibro Stone Columns at 28.5m depth using Wet Top Feed methodology and Timber Piles at 13m depth. The deeper sand responded more readily and efficiently to vibro treatment than the upper layer. Following completion of the trial area, it was decided to build additional SC at 13m depth at every second centroid to meet the specified CPT resistance. The TP, subcontracted to a local contractor FRPD, were ensuring the lateral stability of the dike in case of earthquake. They were driven along the northern face of the ground improvement area, at every centroid of the SC mesh.